Singaporean filmmaker Boo Junfeng took five years to complete his latest film, Apprentice, and the end result is nothing less than astounding. Apprentice brilliantly depicts the tortured emotions that a hangman goes through while executing criminals in prison. It shows how difficult it is to kill another human being, even if it is the person’s sworn duty. When the film was screened at a number of international film festivals earlier this year, , including the prestigious Cannes Film Festival, it received standing ovations and rave reviews. It went on to take home the Network for Promotion of Asia-Pacific Cinema award at The Taipei Golden Horse festival, as well as the Best Acting Ensemble award in Hawaii and the Interfaith award in St Louis in the US. Boo was also named rising director at South Korea’s Busan International Film Festival in October. “I am not advocating five years as a natural period for people to make a film,” says Boo. “But if you want your film to mean anything to [your audience], it deserves all the time it needs to be made. “A good film should outlive the filmmaker,” he added at the press conference after the recent Malaysian premiere of the film in Kuala Lumpur. Apprentice centres on a Singaporean Malay correctional officer, Aiman (played by Singaporean actor Fir Rahman), who is recently transferred to the territory’s top prison. At his new workplace, Aiman, 28, forms a close relationship with Rahim (Malaysian veteran Wan Hanafi Su), who is the longserving chief executioner at the prison. Rahim later asks Aiman to become his apprentice. However, Aiman is keeping a secret. His father was executed by Rahim, a fact which haunts Aiman and causes him to have mixed feelings about his new boss. Boo does not hide the fact he is against the death penalty. He says: “Fundamentally, I do not believe the state should have the right to take a life.” Yet he insists he does not push his beliefs to the audience in Apprentice. Instead, he hopes that the film will spark a healthy debate about capital punishment. “It is necessary for any society to examine [certain] issues, especially if they [relate to] life and death, from time to time,” he adds. One of the film’s biggest strengths is its two leads, Fir and Wan. To understand his character, Fir met with a woman whose husband was executed. “She told me that her husband felt it was better for him to be hanged, because the longer he stays in the prison the more his family will suffer,” he says. Meanwhile, Wan got to meet an executioner to help him get into character. The man turned out to be nice, and that encouraged Wan to put some humanity and compassion into his character. Boo, on his part, did a lot of research, including reading Once a Jolly Hangman by Alan Shadrake. The controversial book, which criticised Singapore’s judicial system, also included an interview with Singaporean hangman Darshan Singh, who was an executioner for over 50 years. Boo also interviewed former executioners, imams and priests who helped death row inmates in their final moments prior to their execution. He also met the families of those sentenced under the death penalty and how they dealt with this bitter reality. 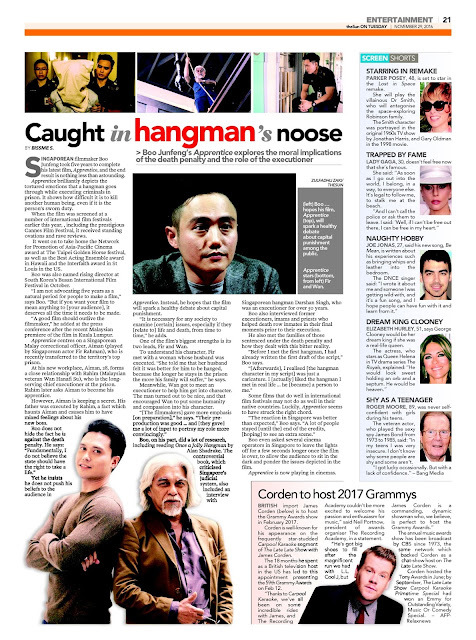 “Before I met the first hangman, I had already written the first draft of the script,” Boo says. Some films that do well in international film festivals may not do as well in their native countries. Luckily, Apprentice seems to have struck the right chord. “The reaction in Singapore was better than expected,” Boo says. Boo even asked several cinema operators in Singapore to leave the lights off for a few seconds longer once the film is over, to allow the audience to sit in the dark and ponder the issues depicted in the film. Footnote Apprentice is now playing in cinemas.